First introduced in Pokémon X and Pokémon Y, Mega Stones are a special type of Held Item, which when triggered in battle, can cause the Pokémon holding its associated Mega Stone, to evolve. 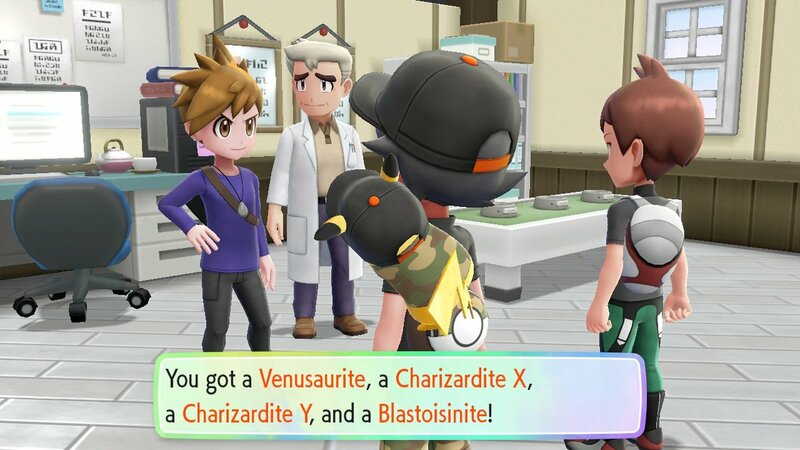 While everyone is not a fan of using them, they can make battling fun and unlike Z-Crystals, you can acquire them in Pokémon: Let’s Go, Pikachu! and Pokémon: Let’s Go, Eevee!. But how does one get them? Are they given out by NPCs? Can you buy them? Must they be earned? Well, that’s precisely what we’re going to be covering in this guide, but cards on the table, a lot of them will need to be purchased and they’re not cheap either. With that in mind, here are two lists, with the first dedicated to Mega Stones that can be earned by playing and the other dedicated to Mega Stones that must be brought. How to Acquire: Once you have obtained 7 Gym Badges and unable to enter the 8th Gym in Viridian, you and your Rival will want to head to Professor Oak’s lab. Here the Venusaurite Mega Stone will be given to you, along with a Key Stone and 3 other Mega Stones. How to Acquire: Once you have obtained 7 Gym Badges and unable to enter the 8th Gym in Viridian, you and your Rival will want to head to Professor Oak’s lab. Here the Charizardite X Mega Stone will be given to you, along with a Key Stone and 3 other Mega Stones. How to Acquire: Once you have obtained 7 Gym Badges and unable to enter the 8th Gym in Viridian, you and your Rival will want to head to Professor Oak’s lab. Here the Charizardite Y Mega Stone will be given to you, along with a Key Stone and 3 other Mega Stones. How to Acquire: Once you have obtained 7 Gym Badges and unable to enter the 8th Gym in Viridian, you and your Rival will want to head to Professor Oak’s lab. Here the Blastoisinite Mega Stone will be given to you, along with a Key Stone and 3 other Mega Stones. How to Acquire: Once you have beaten the Elite Four, in the Post-game, you can enter Cerulean Cave to catch Mewtwo. Once you have beaten and Capture Mewtwo, you’ll want to leave the cave. After a chat with your Rival, you’ll want to go back to where you fought and caught Mewtwo. Although you can’t catch a second Mewtwo here, you will see a very familiar trainer, who will give you the Mewtwonite X and Mewtwonite Y Mega Stones. As always, we hope you found this guide! Tags: Eevee, Guide, Mega Stones, Nintendo Switch, pikachu, Pokémon Let's Go!